In The Wind Birds: Shorebirds of North America, nature writer and novelist Peter Matthiessen wrote: “The restlessness of shorebirds, their kinship with the distance and swift seasons, the wistful signal of their voices down the long coastlines of the world make them, for me, the most affecting of wild creatures. I think of them as birds of the wind, as ‘wind birds.’” Matthiessen died in April 2014, leaving a rich and enduring body of work that reflects his connection with birds such as these Sanderlings. When nature writer and novelist Peter Matthiessen (pr. MATH-i-son) died in April of 2014, he left a rich and enduring body of work. Some of his earliest nature writing made clear his profound connection with birds. Matthiessen drew attention to the Sanderling, the small, pale sandpiper we often see on summer beaches, a bird that makes a round trip of some 16,000 miles between Greenland and Chile. Long-billed Curlew plaintive song  recorded by G. A Keller. 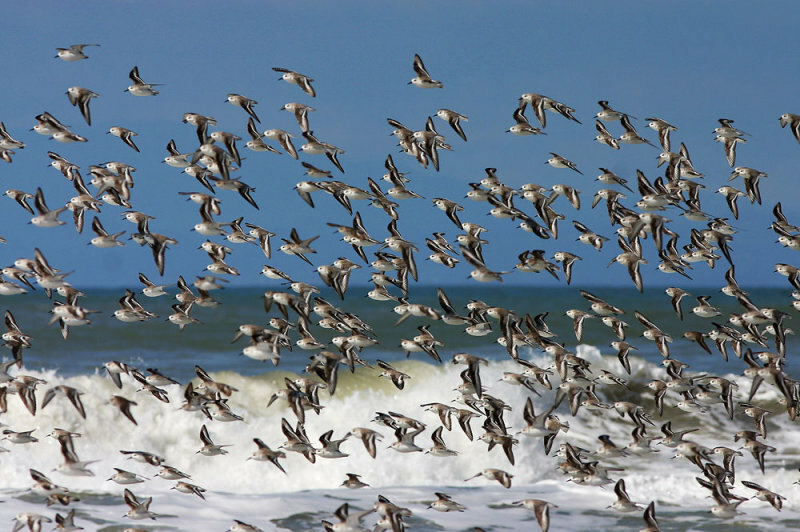 Calls of flocks of Sanderlings  recorded by R. S.Little. Surf recorded by Gordon Hempton [Nature Essentials SFX #23] at QuietPlanet.com.